For a long time now, I’ve been struggling with trying to explain what the true value of a tarot reading is. I know that when people go to a tarot reader, they think they are buying information. And they often get some information out of it. But a lot of the time what comes out in the cards is stuff that they already know. It’s stuff that *I* didn’t know, because I didn’t know the person who came in or their situation ahead of time, so good for me, isn’t that a nice trick. But that leaves me asking myself, what’s the value of this exercise for the client? Because my clients tell me that they find the readings very helpful. And many of them come back for more. So what are they getting out of it? Sometimes, yes, information comes up that they didn’t know, but I believe that’s fundamentally not the point. Because if it’s information about the future, I’m sorry, but they could have just waited and found that out on their own. And waiting costs nothing, whereas I currently charge $60/hour. I have come to believe that the true value of the reading has nothing to do with what I tell you. A big part of the value comes from having the cards tell you what you already know. Especially if it’s something that you knew, but you didn’t know that you knew it. Why? Because it feels like the universe, the multiverse, really, is validating your experience. Through the cards, the multiverse says, “I see you, I hear you, I recognize what you’re going through, I BELIEVE you.” How many of us have struggled with not being heard and seen, with making our true selves invisible, with not even believing ourselves? Rationally, that may sound like nothing. Rationally, it sounds like all you’re getting there is a little sympathy. But scientifically, we know that when we look at something, we change it. It’s called the observation effect. It’s true in anthropology, when scientists study cultures that are not their own. It’s also true in quantum physics, in that we can’t know the location of an electron in an electron cloud until we observe it. It’s true in your daily interactions with people, where you’ll find that if you look at someone long enough, that person will turn around and look back. And it’s true in magic. You can change a situation, just by looking at it. 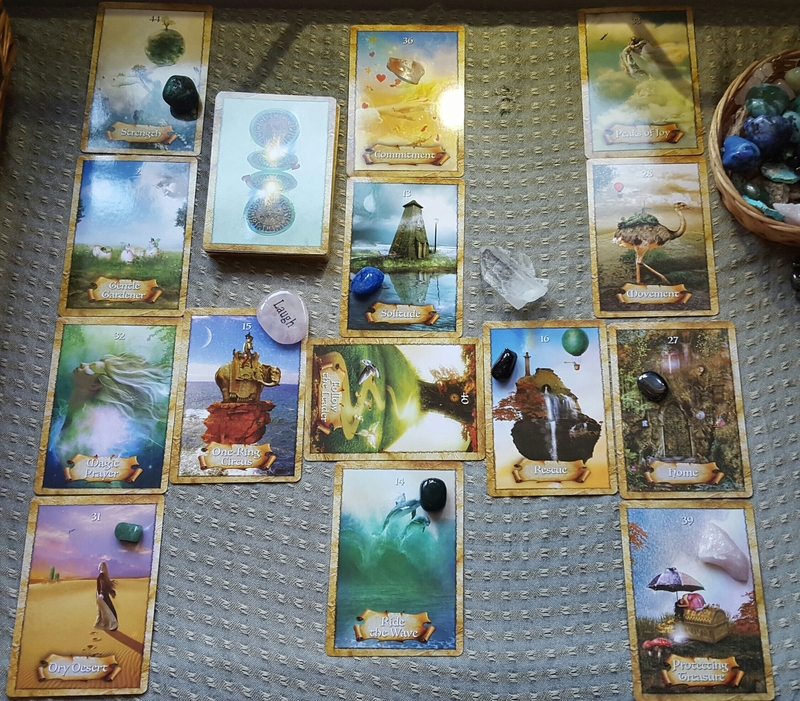 When someone decides to have a tarot reading in order to look deeply at a situation, to hear and see it better, that situation DOES change, in response. Part of what happens, I believe, is that when you open space around a topic, much as occurs in meditation, things rise up. You’ve held a space open, and in that safe space, the things that were stuck suddenly have room to move again. Things clear, and energy starts to flow in places where it was sluggish or plugged up before. Yes, a space is literally nothing. You are holding nothing around the situation. But that space, that nothing, is the very thing, or rather the very no-thing, that is needed to clear the flow of energy in your life. You’re not really coming to a tarot reading to get knowledge. You’re coming to get a clearing. You’re coming to look closely at a situation in order to make it possible for change to rise up and happen. You’re coming to experience the healing of being seen and heard–not by me, because I’m nobody, but by the multiverse. This is what I think is the value of tarot. It helps us to stop shoving everything in our lives into little compartments where they can’t expand and grow. It helps us to open the lids, maybe even to open Pandora’s box. Did you ever think about what would have happened to Pandora’s box if it hadn’t been opened? Would it eventually have exploded? Or just rotted from the inside out? What I think happens in a reading is basically this: we look at the situation. We surround that situation with nothing–just space, just hearing and seeing, INCLUDING hearing and seeing that the universe hears and sees and is providing open space. When we hear and see, when the universe responds, not only does change arise because it finally has space in which to move, but in addition, we may also find that we forgive ourselves, and that we forgive the people around us, because in that space we can see and hear ourselves, too; we can see and hear others; and we can see and hear the ways in which we, ourselves, and our families and friends, too, have been stuck. And we can hear and see that maybe just a little space, just a little objectivity, just a little replacing judgement with compassion, just a little NOTHING, can open up room for us to get unstuck and wiggle out of those sticky places where we felt so trapped, into a new space where we have the room and freedom to make our own most magical choices. Remember that, as Rumi said, “You are not a drop in the ocean. You are the entire ocean in a drop.” You are a microcosm of the entire everything. All the information you need is inside you, like a road map. I’m just helping you unfold the road map on a table so you can see it better. All you need is a little space to spread the map out, and a little distance because unless you’re extraordinarily nearsighted, you will find it easier to see that which is a little bit further away from your eyes than you do to read something that is right in front of your face. Next Relationship Tarot: How Can I Choose? And thank you for the comment! I’m so glad you liked the post. Liberation comes with validation. We can stop spinning our wheels then, and that can potentially save us or our client a whole lot of wasted time, energy, heartache and even resources, including money. Tarot has the power to help us get unstuck. Liberation! Yes, that’s a good word for it.